Shiney Pet’s nail clippers feature a high-quality plastic handle with textured grips that allows you to safely cut your cats nails. Designed for all small animals, these clippers use durable, stainless steel blades set at an angle, giving you precise, clean cuts every time you use them. As your trimming, the window style opening gives you a clear view of the nail, making it easier to avoid the sensitive quick. These scissor style clippers have comfortable finger rests and ergonomic design that makes them easy to handle. Each of Shiney Pet’s nail clippers consists of materials that are safe to use on pets with sensitivities to certain materials. These materials guarantee these clippers will last and come with a lifetime replacement warranty. 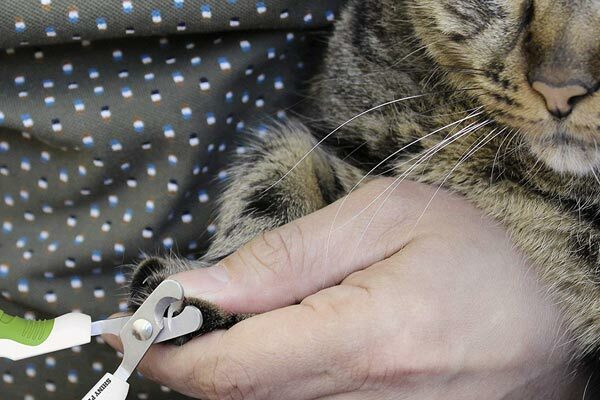 Resco’s Original Pet Nail Clippers can clip the nails of all animals, including cats. They feature durable steel construction with the option to add a comfortable grip handle for better stability. Its guillotine-style cutting tip makes it easy to cut your cat’s nails while avoiding the quick. In addition, these nail clippers use micro-honed blades that are sharp enough to cut through tough nails with ease. It’s unique design also allows you to cut nails of any size, from kittens to large breed dogs. Unlike standard nail clippers, each blade’s easy to remove and replace, saving you money by not having to buy a new set of clippers. These high-quality nail clippers by Boshel come with 3.5mm thick, stainless steel blades that offer clean cut with one squeeze of the handle. Its handle features durable plastic construction, equipped with anti-slip grips for better handling. This anti-slip grip prevents accidental slipping that could result in cracking or breaking of the nail. 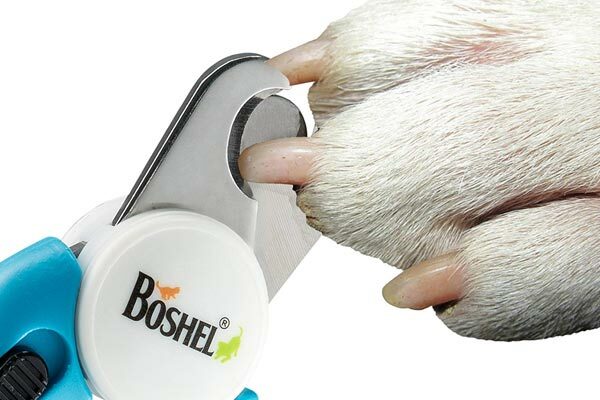 For added protection, each Boshel nail clippers comes with a safety stop blade. This blade helps prevent cutting the nail too short by stops users for pushing the nail too far into the clippers. Additionally, these clippers last several years before being replaced, without ever getting too dull to cut. Epica’s professional nail clippers cut through your cat’s nails in one gentle squeeze. It’s professional grade, stainless steel construction won’t bend or break and it’s rust-resistant, guaranteeing that it’ll last for many years. On top of the stainless steel frame sits a rubber grip that conforms to your hand and gives you better control while cutting. Epica uses durable, steel blades that cut through thick nails without leaving sharp edges behind. These blades never dull, allowing you to cut your cats nails without ever needing to buy new clippers or replacement blades. With its convenient safety guard, you’ll never have to second guess whether your cutting too much off. H&H’s cat and dog clippers can clip the nails on any small animal, from birds and ferrets to cats and small breed dogs. These clippers feature a lightweight design that never wears out your hands and allows you to take your time clipping your cat’s nails. Its steel construction makes them durable for regular use and it’s slip-proof grip offers a comfortable, secure grip to avoid accidental injuries. Each set of clippers have a stainless steel blade that quickly snips the nail without causing damage. The blades never lose their sharpness, allowing you to clip your cat’s nails for years, without having to buy a new pair. At the bottom, these clippers have a locking edge clip that keeps your clippers secure when not in use. Why Should I Clip My Cat’s Nails? A cat’s nails serve as their way to scratch, climb, hunt, and defend themselves against predators. However, unkempt nails can cause a variety of problems for you and your cat, especially if you don’t have a set nail clipping schedule. 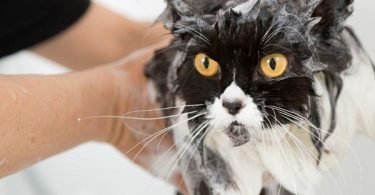 In fact, an article published by the Humane Society offers an in-depth look into the problems your cats could have with unkempt nails. A cat’s claws are a breeding ground for all types of harmful bacteria. When a cat’s nails grow too long, they begin to curl and tuck under their paws. As they continue to grow they begin poking and cutting the sensitive pads on the bottom of their feet causing pain. Once their nails reach the pads of their feet, it can hinder their ability to walk or climb normally. These small cuts or openings on the pads of their feet get exposed to the bacteria on the claws, often leading to infection. 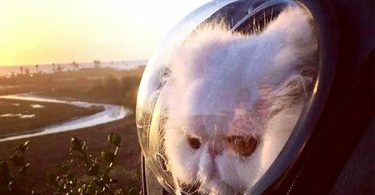 To get rid of the infection, you’ll need to make a trip to the veterinarian who’ll clean out the wounds and prescribe your cat antibiotics. Potentially costing you hundreds of dollars for a problem that could’ve easily been avoided. As your cat’s nails grow and develop sharp points, it leaves them vulnerable to potential snags. If they snag their nails on the carpet, upholstery, or another surface, they’ll struggle to get their nails free, leading to excessive pulling and jerking. During their attempt to get free, they could break their nail or completely dislodge it, causing excruciating pain. Cats are known to climb up curtains, scratch on furniture, and dig their nails into every aspect of your home. By keeping their nails short, you’ll prevent unsightly scratches or tears in your upholstery. Saving you money by not having to buy new furniture or repairing tears and holes. How Do I Clip My Cat’s Claws? The first step to cutting your cats nails focuses on a safe, comfortable holding technique. How you hold your cat depends on their temperament and disposition and since all cats vary from one to the other, there’s no one correct way to hold them. As long as your cats comfortable and relaxed you can have them in your lap, have someone else hold them, or lay them on a table using a firm but gentle hold. Since your cat has retractable claws, you’ll need to reveal the nail to begin clipping. Using your pointer finger and your thumb, gently press on the joint located just behind your cat’s claw. As you apply pressure, make sure that their nail’s fully extended outward, allowing you to see the pink part of their nail. Once you see the nail extend out, carefully clip the nail in a straightforward motion. Avoid clipping your cat’s nails at an angle or in a side-to-side fashion. Cutting your cats nails in a side-to-side motion causes cracks, splinters, or crushing of the nail, resulting in pain. A video by Dr. Mike, a licensed veterinarian, gives you a tutorial on how to clip your cat’s nails at the proper angle. When clipping their nails, you want to clip the sharp points that are translucent in appearance. It’s very important to avoid cutting the pink part of your cats nails, called the quick. The quick has several nerve endings and blood vessels that will cause extreme pain and bleeding if cut. Once you’ve clipped one nail, you may move on to the next one if your cats calm and relaxed. 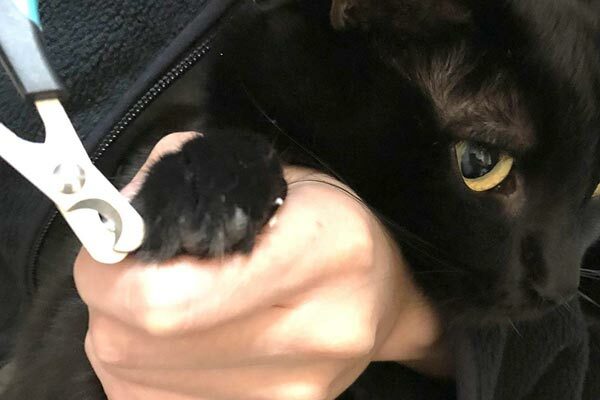 If your cat isn’t used to getting their nails trimmed they might get scared and try to flee, making it difficult to trim all their nails in one sitting. If this occurs, you may need to trim one or two nails per day for each trim until they get used to it. How Often Should I Clip My Cats Nails? The amount of time between trimmings depends on how active your cat is. The more climbing, scratching, and hunting your cat does, the sooner you’ll need to cut their nails. Nail trimmings also depend on the amount of time your cat spends indoors opposed to outdoors. The average time between trims ranges from 10 to 14 days. What Makes A Good Cat Nail Clipper? It’s hard to find good cat nail clippers, especially if you don’t know what to look for. With all the styles and features available on the market, it’s overwhelming trying to sort through them all. However, there are a few things you should consider before you buy a set of car nail clippers. The easier the clippers are to use, the better off you and your cat will be. You want a set of clippers that fit comfortably in your hand, without being too bulky or awkward to handle. Look for a comfortable grip and finger rests that won’t hurt your hand when you are using them. 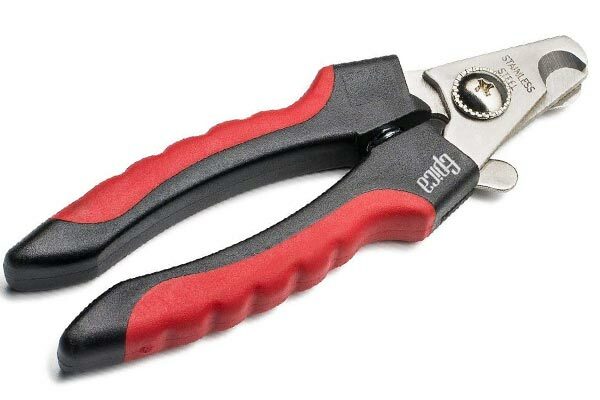 When you’re searching for cat nail clippers, you should look for clippers that have durable blades made from materials like stainless steel. These blades should withstand cutting through tough nails easily without breaking, cracking, or crushing the nail. Make sure the blades aren’t dull, which could damage the nail and cause your cat pain. If you’re an inexperienced user or you want added protection for your cat, look for clippers with a safety guard. This guard sits behind the clippers and prevents you from pushing the nail too far into the cutting zone. With a cutting guard, you avoid cutting into the quick and causing damage to your cat’s nails. 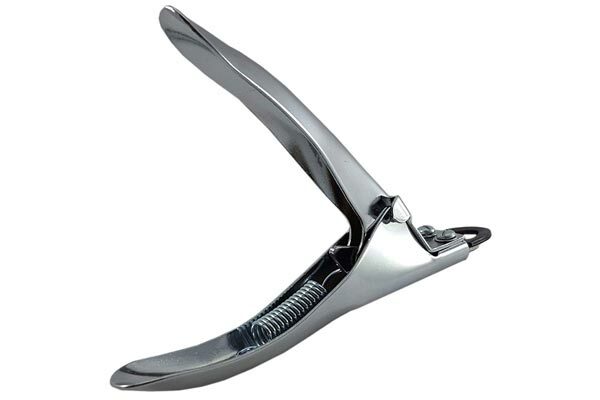 What Styles Of Nail Clippers Are There? There are many styles of nail clippers available for trimming your cat’s nails. 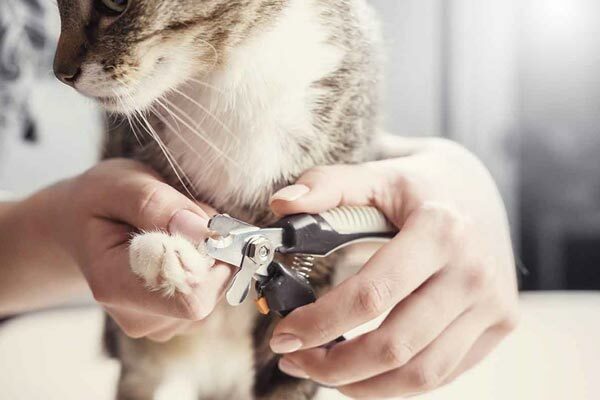 An article by Washington State University gives you a look at all the different types of cat nail clippers and how to use them. One of the best options for cutting your cats nails is regular human nail clippers. They’re the perfect size for a cat’s small nails and they’re easier to maneuver. They also offer a clear view of the nail while cutting, helping you avoid the sensitive quick. The Guillotine style nail clippers use a design that looks like a medieval guillotine. It has two blades in the center of a loop, which come together when you squeeze the handles. There are several different types of guillotine clippers, consisting of different designs and features to help you during your clipping session. This style of clippers resembles your ordinary cutting scissors, with round ends. They range from 3 to 4 inches long and have notches to put your cat’s nails in. Many people prefer this style because it gives you a clear, unobstructed view as your cutting your cats nails. How Do I Get My Cat Used To Nail Clipping? When you first bring your cat home, it’s important to start getting them used to regular nail trims as soon as possible. By using the proper steps, implementing rewards, and staying diligent, your cat will get used to nail trimmings after the first couple trims. According to the ASPCA, it’s best to start by placing your cat in your lap when they’re calm and relaxed. Then gently touch or massage their paws with your hand for a few seconds, allowing them to get used to you touching their paws. Gently press their paws to expose their nails and then release them so they retract back into place. After releasing their paw, give your cat a treat and lots of praise. If your cat remains calm, you can begin the process of clipping each of their nails. Rewarding them with a treat and giving them praise after each nail that you trim. It’s important to avoid restraining your cat if they try to flee, it’s not uncommon for cats to become scared after clipping just one nail. If you cannot cut more than one or two nails in one sitting, that’s okay. Repeat the process every day until all of their nails get trimmed. Eventually, by taking the right steps, your cat will sit long enough for you to clip all of their nails in one session. Should I Clip My Kittens Nails? As your kitten grows, their nails will get longer and develop sharp points. You should carefully clip just the tip of your kitten’s nails to avoid unnecessary snags or curling. According to Vetstreet cutting your kittens nails also helps them get used to nailing trimmings at an early age, making it easier to clip their nails as an adult. Before clipping your cat’s nails, you should consider the amount of time your cat spends outdoors. If you have a primarily outdoor cat, it’s important not to cut their nails to often, as it will affect their ability to defend themselves. Outdoor cats need their sharp claws to climb trees to flee from danger and to hunt for food, cutting them too short could prevent them from doing so. Another important thing to consider is the sharpness of your nail clippers. Once the Clippers begin to dull, it’s important to throw them out and get new ones. 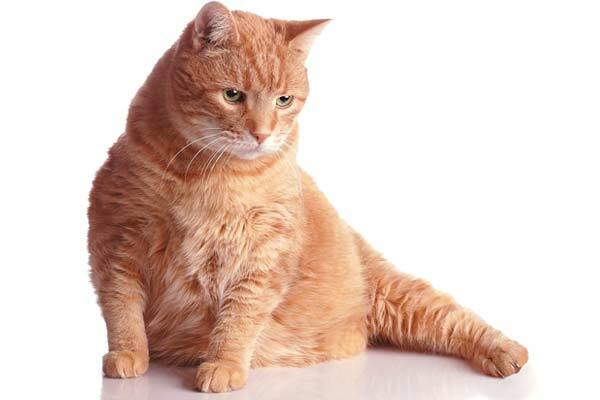 Trimming a cat’s nails will dull trimmers could crush or crack their nails, causing extreme pain and discomfort.